Spend time with your little ones this weekend celebrating all things winter at Thompson Park’s WinterFest in Lincroft, practicing yoga at Adventure Aquarium’s Yoga Day in Camden, tasting the best mozzarella in the tri-state at Hoboken Mutzfest, plus so many more kid-friendly things to do around New Jersey this weekend. The Fire and Ice Festival combines the best of the chili world and ice sculpting world into one amazing event. Let your taste buds go wild as you feast on all the chili Burlington County has to offer, and then vote for the People’s Choice Award for Finest Chili. After you’ve got your fill of the excellent chili options, watch professional ice carvers transform 300-pound blocks of ice into breathtaking ice masterpieces. To top it all off, there will also be fire truck rides for all the kiddies. You will be hooked once you check out this Fly Fishing Show. Pun intended. For three days in its new location at the New Jersey Convention and Exposition Center in Edison, immerse yourself in the world of fly-fishing with other enthusiasts, authors, and celebrities. This fan-favorite show will also feature fly tiers, exhibitors, and a learning center. The International Fly Fishing Film Festival – IF4 is back for one night only on Friday, January 26. Is shopping with your kids a nightmare? Well, the Berlin Market is a dream come true. Every Friday for the rest of this year, this marvelous event offers free face painting, balloon characters, and airbrush or glitter tattoos to dazzle the kids. What better way to spend your Friday night than getting in some shopping while eating good food and making memories at the Berlin Market? Embrace and celebrate winter with your entire family. WinterFest is a fun family day that includes cross-country skiing, hands-on activities, wagon rides, arts & crafts, photo opportunities, and living history displays. Looking for a gem of an activity to do this weekend? Bring your family out to celebrate the 50th anniversary of the Geology Museum. With a host of educational activities, lectures, arts and crafts, a mineral sale, and free fossil and mineral identification, you’re sure to find a diamond in the rough when you check out this event. The Family Weekend Series Program: “Ready for Robots!” allows families to learn about how robots respond to their environments. This is a great hands-on program for parents and children alike. Cost: $25 General Admission, $20 LSC Members; Price includes science center day admission. Registration is required. Please call 201.253.1310 or email sales@lsc.org to reserve a spot. Find out if you can handle the heat at Meadowlands Home-Style Chili & Salsa Cook-Off. Get your taste buds going by trying out all the different kinds of chili and cast your vote for the People’s Choice Award. 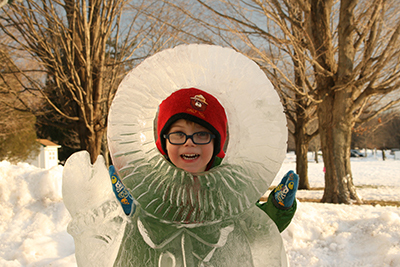 Come join Friends of High Point State Park for the Annual Winter Festival. The schedule for this exciting event ranges from indoor and outdoor games, ice fishing, fun with snowshoes, sled dog demonstrations, curling, bird crafts, guided hikes, weather talks with local meteorologist Nick Stefano, story time for kids, and sing-a-longs. Light refreshments will be available as well. The cold never bothered you anyway, right? Join families from all over New Jersey for a day of super cool family fun at the Frozen in Ice extravaganza at Skylands Stadium. And get ready to buckle up, because this year’s event will feature 100 tons of ice sculptures set in an interactive Wild West theme! Not to be missed is a giant 50-foot ice slide, ice saloon, ice carving demonstrations and competitions, ice games, food and beverage vendors, s’mores fire pit, skating rink, and more. After all the jam-packed fun, your family can enjoy dinner and drinks at WheelHouse Craft Kitchen + Bar. This very “chill” event can only be experienced at Skylands Stadium, one of North Jersey’s premier sports and entertainment venues and home of the Sussex County Miners. Go big or go home. Monster Jam Triple Threat Series brings adrenaline-charged family entertainment to fans across the country, and this weekend, it will be right here at the Prudential Center. These world-class Monster Jam vehicles and athletes deliver what fans want to see most – more trucks, more racing, more freestyle, more donuts, more wheelies, more action! Each event tests the versatility of the athletes as they go head-to-head in seven different competitions driving three different vehicles – Monster Jam trucks, Monster Jam Speedsters, and Monster Jam ATVs. These athletes will battle for points in challenging Racing and Freestyle events that push themselves and their machines to the limit. The point leader will receive an automatic bid to the prestigious Monster Jam World Finals to compete for the title of World Champion. Wassailing is an ancient British tradition of dancing, singing, and chanting to the trees to ensure a successful crop for the next season. In addition, guests can make toasts of hot cider and place gifts of cider-soaked bread in the tree branches in hopes of a successful New Year. Don’t forget to warm yourself next to the bonfire and enjoy the live music. Lastly, remember to bring your noisemakers (drums, whistles, bells, and clackers, too!) because the louder things get, the more fun it will be! Join your fellow Yogis for a unique and relaxing experience you won’t forget. Classes will be 75-minutes long and taught by one of Adventure Aquarium’s own yoga-certified biologists. Choose from an Aquarium and Yoga Combo ticket or a Yoga Only ticket. For family members not participating in the yoga class, you may purchase a Guest ticket to visit the aquarium at a discounted rate. Must be 18 years+ to participate in a yoga class and yoga mats not provided. The Lunar New Year at the Shops at Riverside is celebrating the Year of the Rooster with performances by the Korean Traditional Dance of Choomnoori. Dancers in colorful costumes will perform traditional Korean dances, such as the fan dance and a drum dance. Join the Hoboken community for a fun-filled day celebrating Italian Americans’ favorite cheese – mozzarella! Featuring eight of the city’s most renowned mozzarella eateries, this annual event is fun for all the senses and the ages. To top things off, there will be a Frank Sinatra sing-a-long to get you in the mood, and for dessert, you guessed it – a cannoli eating contest.